As Italy’s largest lenders join forces with the government to play down the country’s economic slowdown, one bank chief says it’s time to wake up. Unione di Banche Italiane SpA Chief Executive Officer Victor Massiah said on Friday that Italy’s dimming economic outlook means his company needs to produce a new business plan based on today’s reality. The existing strategy, which expires at the end of 2020, is based on assumptions that are no longer valid, he said. Following broadly positive fourth quarter earnings among Italian banks, some executives sought to accentuate the positives in an Italian economy that slipped into recession in the fourth quarter. The European union slashed its growth prediction for the country to 0.2 percent and the International Monetary Fund and the Bank of Italy also recently cut their forecasts to well below the 1 percent the government used in planning its budget. 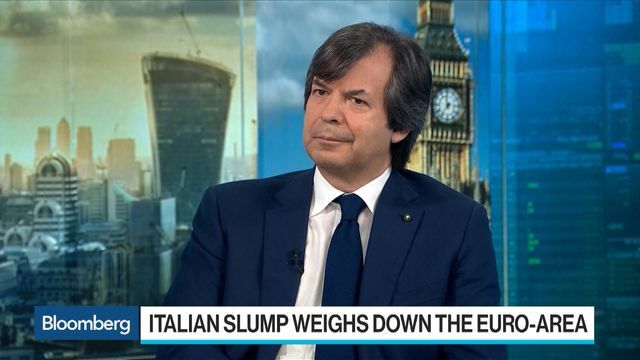 Italy is in a “slowdown” rather than a recession and the economy may show a “clear recovery” in the second half with a rebound in exports, Intesa Sanpaolo SpA CEO Carlo Messina said on Bloomberg TV. The current decline is mainly due to the slowdown in Germany, he said. Optimism was also showed by his main rival Jean Pierre Mustier, the CEO of UniCredit SpA, who said that he is very positive on Italy and expects moderate growth this year. While UBI has done better than expected on costs and cleanup, it falls short on the revenue side mainly do to low interest rates and the economic outlook, said Massiah. At the moment, it is hard to say if the outlook deterioration is contingent or structural, but the management is preparing to face both options, said Massiah. Banca dei Monte Paschi di Siena SpA was another exception to the positive spin on the economy, saying Thursday that it cut the bank’s financial forecasts in its restructuring plan, which runs through 2021, to account for worsening economic conditions and the high debt spreads. Monte Paschi is in a different situation than its peers because its restructuring plan is under the close scrutiny of European and Italian authorities following the bank’s 2017 state bailout.